Yup, you read correctly. 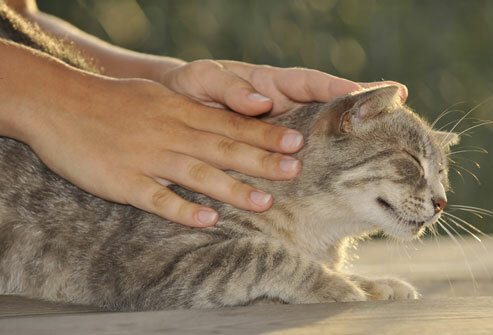 The latest thing in caring for your pet is pet massage. Before you convince yourself it is useless, let me assure you, it has been proven to have positive benefits, just as it does for humans. First of all, it can help strengthen the bond between you and your pet. It has also been known to relieve some pain in the instance of arthritis, muscle stiffness, or pain from previous injury. Massage can stretch the muscles and relax inflamed areas to relieve the stress that is causing pain. Before you decide that it’s not worth trying, I suggest going to get a massage yourself. If done correctly I guarantee you will feel refreshed and energized. After receiving one yourself if you still believe it’s not worth the trouble, than it’s of course not for you. If you do decide you like this option for your pet, there are a couple ways to handle it. You can talk to your vet (which is always a good idea for any decision), search for a pet massage therapist in your area, or look up the techniques yourself on the internet. Your vet may be able to do some massage in the office or suggest someone in your area. If you are going to do it yourself, please do lots of research, done the wrong way massage can cause injury. Here is a website that has quite a bit of information including videos that show you how to massage specific body parts. http://www.monkeysee.com/play/2163-how-to-massage-your-dog. A widely used technique is the T-Touch, or the Tellington Touch named after Linda Tellington Jones. She has books and videos on how she has used this technique to help and comfort animals with both physical and mental conditions. Not only is it easy and effective, it is also safe to practice at home. She also does workshops. You can find more information at the website http://www.ttouch.com.